"Taitung prosecutors indicted for crimes against English"
The article correctly points out that English is the lingua franca of Taiwan. The overall level of English in Taiwan is indeed impressively high, so much so that it is often mixed in with Mandarin or Taiwanese when people are speaking. Consequently, this sort of thing doesn't happen very often (in comparison to other places where mangled English is rampant). And, when it does, people usually (but not always!) catch the blunder quickly and make a fuss over it, as in this case. As a US citizen who has lived in Taiwan and taught English here for the past eight years, I have to say that it is not so simple as to state that English is the lingua franca of Taiwan. If there is one, it's more likely to be considered Mandarin (many older people and people with less formal education speak Taiwanese much better than Mandarin, and many speak and understand very little or practically no English). The population can look a lot different if the sampled bit is businesspeople in Taipei. And almost any English sign or menus offers plenty of "Engrish" for us to laugh at. The Want China Times article begins: "English is the lingua franca Taiwan uses to help guide foreign visitors around the country…." I saw. And the post here certifies it as "correct". Based on what? I say the real situation is not so straightforward, though it can be argued either way how widespread and well-spoken/understood it is here, or how that is only how it seems to certain people who speak English well and spend their time primarily around Taiwanese English-speakers who tend to be over-represented in certain social contexts. Not that I meant to be critical. Just a touch of irony that the post here had a typo or misspelling (and sure enough, so in turn did mine, with "menus" instead of "menu"). I see and hear funny English here every day. The post doesn't capture Taiwan all that well. Not awfully badly, but just not all that well. Based on the fact that when visitors from Russia, Greece, Australia, Spain, Iceland, Sweden, Norway, the Netherlands, Estonia, and practically any other country on earth come to Taiwan, they rely on English to get by (except for the exceedingly small proportion who know Taiwanese or Mandarin). The post suggests that it's ironic or surprising to find a mistake like this in Taiwan where English is so well and widely spoken. That's simply way off. "Taiwan ranked ninth among 12 Asian countries rated in an English skills index published in Chinese yesterday, outperforming only Vietnam, China and Thailand." Compare to your "this sort of thing doesn't happen very often (in comparison to other places where mangled English is rampant)." You don't know what you're talking about. That's all. "You don't know what you're talking about. That's all." Don't you think that's a bit over the top? I do know what I'm talking about, since I've spent many years of my life travelling in East Asia. You quoted this remark from my post — "in comparison to other places where mangled English is rampant" — but totally ignored it. Of course, there is plenty of Chinglish to be found in Taiwan, and I've written about it often on Language Log. But compared to that other place across the strait, there's far less. Any sensitive reader would have known that's what I was referring to, but I didn't want to state it so bluntly. As an English teacher in Taiwan, I could certainly see that English is the lingua franca of the exception, not the rule. I posted all of my comments in the wrong frame of mind here. If your policy allows, please delete them and let me try to contribute positively later if I can. Otherwise, yes. Over the top. I was not thinking or feeling that charged up or disparaging at the time. Bad choice of words and wrong mood. I'm sorry. Having only visited Taiwan once myself, I'm inclined to agree that the level of English in Taiwan isn't bad within East Asia, but… English is the language relied on to get by "except for the exceedingly small proportion [of visitors] who know Taiwanese or Mandarin" (and thus "English is the lingua franca" or "English is the lingua franca Taiwan uses to help guide foreign visitors")…? Which is probably true, unless you count those coming from Hong Kong, Macao and "that other place across the strait", which account for over half of the visitor count combined? This is just as true of China as it is of Taiwan (well, visitors from Russia to Russia-bordering areas possibly excepted). It doesn't mean the English in China is noticeably better than the English in China, though. Why should it mean the English in Taiwan is better than the English in China? If the best you can say about your English proficiency is that it's slightly better than is typical in China, that doesn't qualify as "impressively high". "It doesn't mean the English in China is noticeably better than the English in China, though." Don't know what you're getting at here. I lived in Taiwan from 1970-72 as a teacher of English and translation at Tunghai University, and the level of English there at that time was not very high, but when I went back again in the mid-80s, I was astonished at the enormous strides that had been made in the overall level of English. I'll never forget landing at the airport and being amazed by the fact that practically everyone I met in the airport spoke English, even though I was prepared to converse with them in Mandarin. And after spending a while in Taiwan on that occasion and on subsequent occasions, I was surprised by how many businessmen, engineers, scientists, medical workers, government employees, and professors had studied in America and had really good English. During the 70s and early 80s, Taiwan — if I recall correctly — had the highest number of foreign students in America, the only competition being from Iran, since the Shah of Iran was paying all tuition and fees for many thousands of Iranian students, though that ended abruptly when he was overthrown by the Islamic Revolution in early 1979. Since 1981, I've been to China nearly a hundred times, so I have a very good sense of the level of English ability among the populace there. I must say that, within the last 5-10 years, the level of English has picked up greatly, but that is mainly among the urban elite. Overall, the level of English ability in Taiwan is considerably higher than on the other side of the strait. The official language of the People's Republic of China (PRC) is Mandarin. The official language of the Republic of China (ROC) is Mandarin. A lingua franca, by definition, is "a language that is adopted as a common language between speakers whose native languages are different." One can honestly marvel at how good it is, or at how little the average person understands and speaks, given that everyone learns it in school. (Only within the past year or two did instruction begin in elementary school, though. One "problem", if it is that, is that teaching methods are mostly memorization of vocabulary words and grammar rules. Terrible ways to learn a language, and quickly forgotten by most students after the tests. Why, however, "should" Taiwanese people make fewer mistakes in English than the average American makes in Chinese? Finally, I admit starting off in reaction to the term "lingua franca", the definition of which I think is easy for many of us, including me, to conceptualize vaguely or incorrectly. English is the primary language that non-Chinese international visitors and correspondents would most likely use to communicate (if they can! ), but there's something about the term or the way it's used sometimes that seems to suggest "that's the language everyone can use to communicate in". Not so here. Fundamentally not so. Holy mackerel! I thought the name "Want China Times " was a typo, but that really is the name of the paper. What the heck is that supposed to mean? I apologise that I am rather off-topic and I am by no means criticising the attention paid by Language Log to "Crimes against English", which I know is not what you are calling them, by the way. It would be no less interesting to see some examples of when and how English speakers mangle up other languages. I find the processes by which English is arrived at fascinating, especially from Chinese (or Chinese languages), which I don't speak at all. I understand that the reverse is less likely to happen, though there may be Chinese people living elsewhere whose children might make well-meant though less successful efforts to produce their parents' language. I can only offer two rather prosaic efforts to produce Spanish. One is "Éxito Aquí" on a Starbucks sign and the other was something like "En caso de fuego no usar los levantamientos"
I produce terrible, ungrammatical Chinese all the time. I don't know any better. "English speakers mangling other languages" is only less likely than the reverse to happen in the sense of the quantity of it that goes on. Then again, I certainly don't go around hanging up signs in gibberish Chinese — in the unlikely event that I did want to put up a sign, I'd have it proofread. I guess I can offer up some examples of my own mistakes, if that's what you have in mind? Stick around. 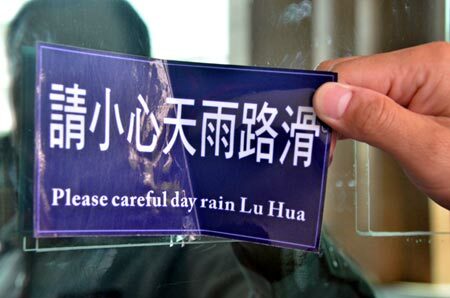 You can be sure that we'll have new posts illustrating bad Chinese translations in non-Chinese speaking countries. @Victor Mair. Thanks for those links. @Michael Watts. I too mangle up the languages that I speak and I could trade you examples for a long time. On the whole I also rightly assume that I'm highly likely to be wrong. What's happening though when someone, or a group of people, or even a whole institution, decides "So that'll be Chinese/English/Spanish/Whatever then" without checking? Is it only an over-confidence in their abilities? When I said "less likely" I was initially talking about frequency, as you supposed. It wouldn't happen so often (perhaps in parts of the US where there are more Spanish speakers, Quebec, touristy bits of London, English-speaking communities in Spain for example) and anyway one'd think that only the most overweeningly confident learners/L2 speakers would feel no need to actually ask around for a translation of their English . It seems odd to forge ahead without doing so. Perhaps English-as-L2 speakers are in fact not so inhibited about their faulty English and it isn't only frequency. English is less anybody's than many other languages are. Maybe learners/L2 speakers of English don't feel the same about English as learners/L2 speakers of other languages do. Because ownership. Indeed, in Taiwan questions of two different tones gets discussed often: "Why is it that foreigners in the USA are expected to speak English, but foreigners in Taiwan are not expected to speak Mandarin?" "How can we maintain a competitive edge internationally when we make so many mistakes with English?". As a whole we're in a constant race to not only speak better than our neighbors in Asia, but also speak better than our neighbors next door too: it's easy to see that there are a lot of national pride and anxiety going on here. Also on the "mixing English with Mandarin or Taiwanese when people are speaking" part, it'd be interesting to look into some research as to how much of it is actual code-switching (I know many people in the academic field who went abroad for higher educations have this habit), and how much of it is common loanwords: phrases like "O 不 OK" (O bù OK) shows that some words are really so ingrained in our native vocabulary. In my experience, the people of Taiwan go out of their way to help foreigners–or at least Westerners who are visibly foreign. More so anyway than the Japanese, the French, or Americans. So even if Taiwanese English isn't perfect, they're willing to use it. I don't like "want" for "旺", but note that it's not just Want China Times; it's used in other brand names as well. "English is the lingua franca Taiwan uses to help guide foreign visitors around the country…"
It sounds to me that what the article is trying to say is that English is the international language *used by Taiwan to guide foreign visitors around the country*, emphasis mine, not that English is the common language of communication for native Taiwanese. The poor choice of "lingua franca" in place of "international language" is the source of this misunderstanding, as the former makes it less obvious that the article was talking about the common language Taiwan *uses to guide foreign visitors*, as opposed to the common language of the Taiwanese themselves. As Jim Reynolds says in the first comment above: "The population can look a lot different if the sampled bit is businesspeople in Taipei." In fact, there is a similar "prejudice" in Europe whereby the Dutch are meant to be always "fluent" in, say, German and English. However, if you then really visit the country outside of the typical tourist venues or office towers, then the pervasiveness of the grasp of foreign languages also seems reduced to levels found elsewhere in the world. However, there is a difference: in countries with a language whose adherents are not numerous enough to warrant synchronization of blockbuster movies or popular (English language) sitcoms etc., you find an amazing amount of people, from the earliest ages, who actually pick up the English language from watching films all day that have but subtitles in their native language, whereas the spoken word is always English! This seems to go for countries as diverse as Latvia, Estonia, South Korea, as the OECD PISA studies about high school achievements suggest.